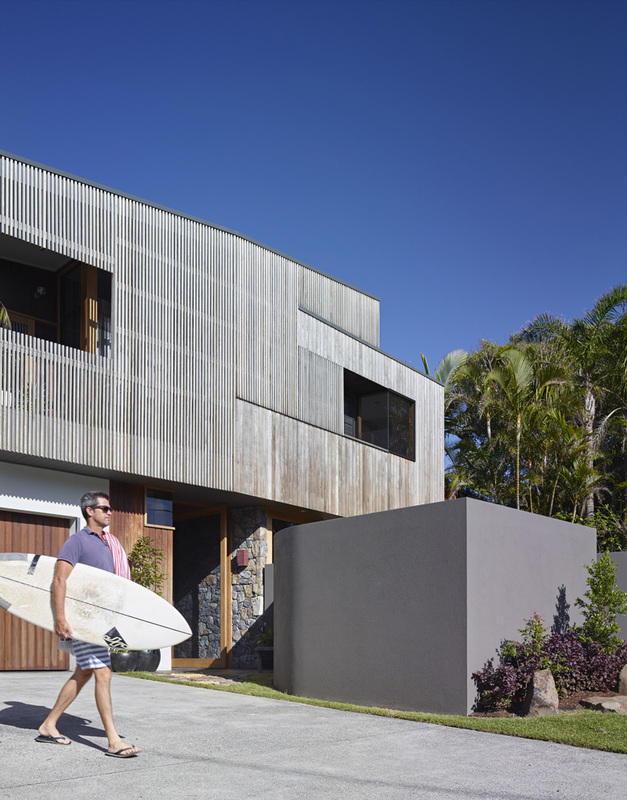 The contemporary home has a combination of coastal and modern design. I don’t know why but we have featured so many coastal homes these days. Maybe because the feel of summer is here or that we all just want a vacation feel in our own homes. Well, whatever moved us to get into home designs like this, what matters is that we are once again bombarded with tons of home design ideas both for the interior and the exterior. What is pleasing about the beach homes or coastal homes we have featured is that they have that modern or contemporary look that fits the lifestyle of people these days. We will feature another coastal home today with a very beautiful design. 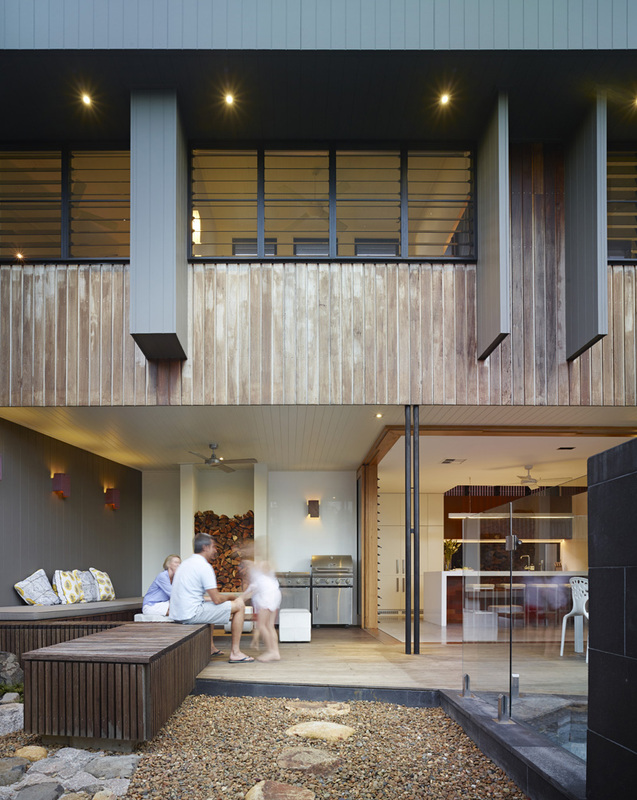 The Sunshine Beach House was designed for a builder, who built the home for his family. 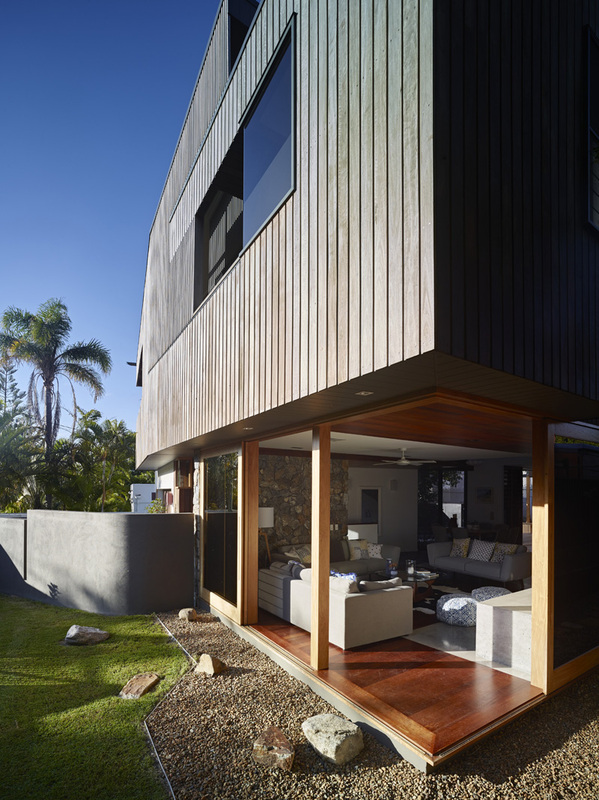 It explores the coastal aesthetic by using graying timbers and natural materials that are bold, but are equally eclectic giving the home a stunning architectural expression. The design of the house is planned around a sequence of courtyards from the north to the south, offering a very comfortable year-round lifestyle. The house is owned and built by Wade Jenner, along with his wife Claire. For the couple, the project is “afforded us a wonderful opportunity to develop and craft ideas we’ve had for a long time with someone who trusted us enough to make them real”. Unique feature: A contemporary house with coastal aesthetics and modern lifestyle featuring a courtyard that offers a comfortable year-round lifestyle. 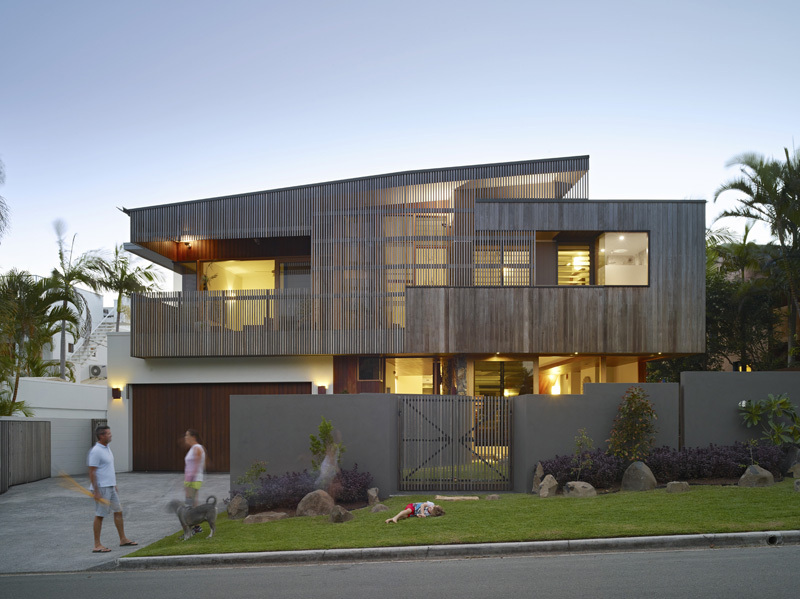 Interesting exterior with some vertical wooden design that appears like a louver. But I guess these aren’t movable. These can filter direct heat from the sun and could add privacy to the home. Seen here is the beautiful curb of the house with plants. So dad is now ready to go surfing in the beach! We can see here that the exterior also has some stone walling too which is a good addition to the architectural appeal of the house. I love the look of this outdoor space with a wooden bench and stones on the ground. The throw pillows on the wooden bench look amazing too and it is a good idea that a cushion was added into it. Using small stones and rocks on the ground would seem to bring the feeling of being in the beach. Aside from that space we saw on the previous photo, there is also a dining area that has white dining set. The dining table has a wooden table top that matches the flooring of the deck. This area is connected to the interior seamlessly and is being defined by the different flooring materials used on the areas. You can also see here a mix of materials in both in the interior and exterior. 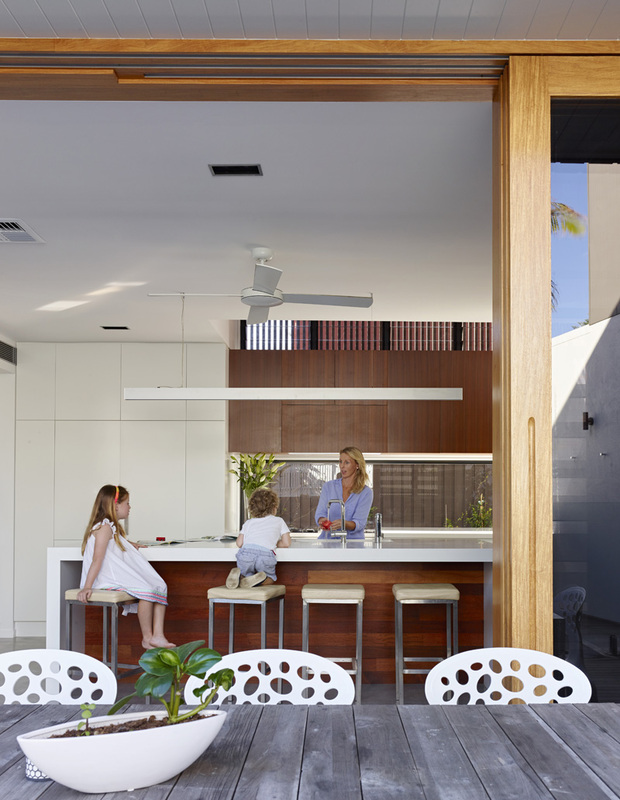 The kitchen is just open to the outdoor space which can be separated from the area through a sliding door. It has a white counter top and wooden material used for it too. The combination resulted into a lovely kitchen island. Notice a picture window in the kitchen too that gives the area a lovely view of the garden. You can also note the use of steel in some items like the high counter stools for the kitchen island. 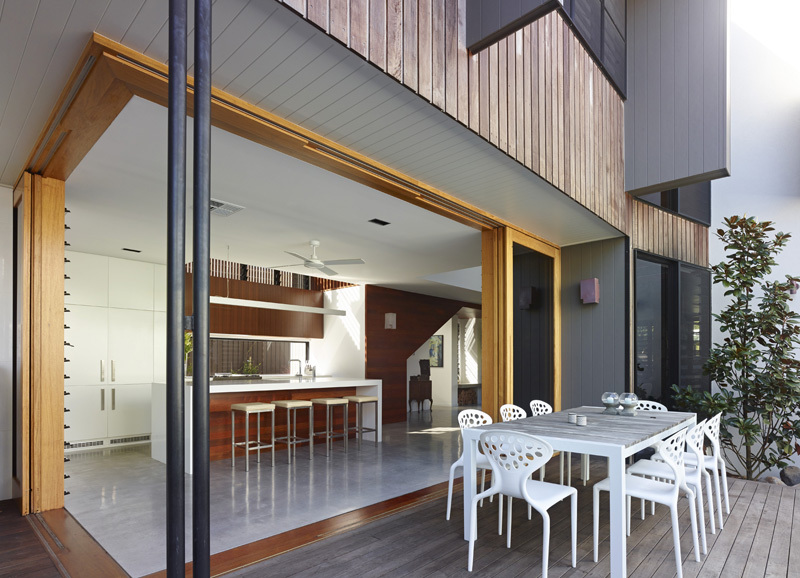 The interior is seamlessly connected to the outdoor area with sliding doors and its use of glass. Sitting in a living room like this would be very comfortable and cozy. It is a good idea to landscape the garden this way wherein some parts has stones and some areas has grass on it. Rocks scattered around the landscape add some hard texture to the home’s outdoor space. The living room has a lovely stone accent wall. It used furniture in white and gray colors with a cowhide on the floor. Pops of yellow and blue are also seen in the living room’s throw pillows. Love it that different patterns and colors were used for the throws. Do you like it too? That triangular coffee table is a pretty unique item in the area. There are many coastal inspired features in the house just like the prints of the ottoman and that wreath on the wall. I like the way the firewood are stored under the television. There is a louver window on one part of the wall which is a good way to control the amount of light and air that will get into the house. 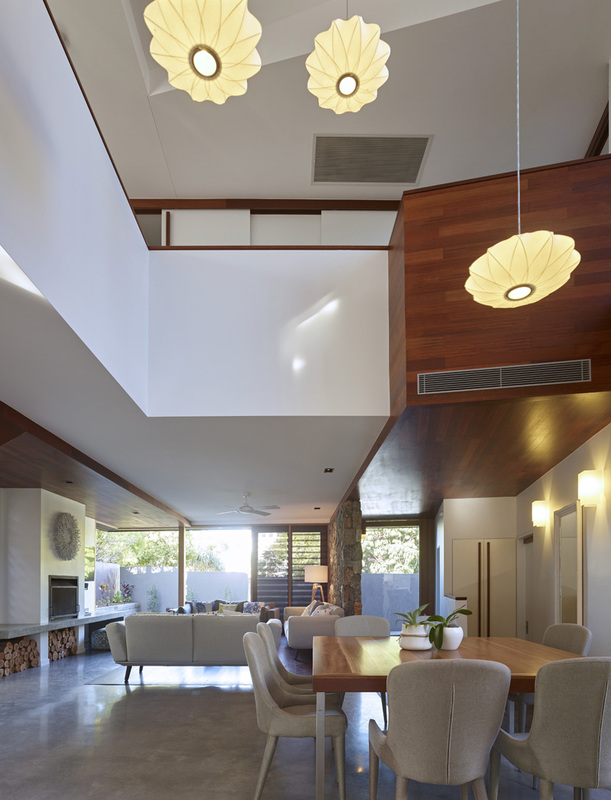 Notice that the interior has a double-height ceiling that made the area look even more spacious. The interior also has an open floor plan with shiny gray flooring. Most of the items in the house revolve around gray colors and wood which is a cool idea for a contemporary home. You can easily feel relaxed in a space like this. 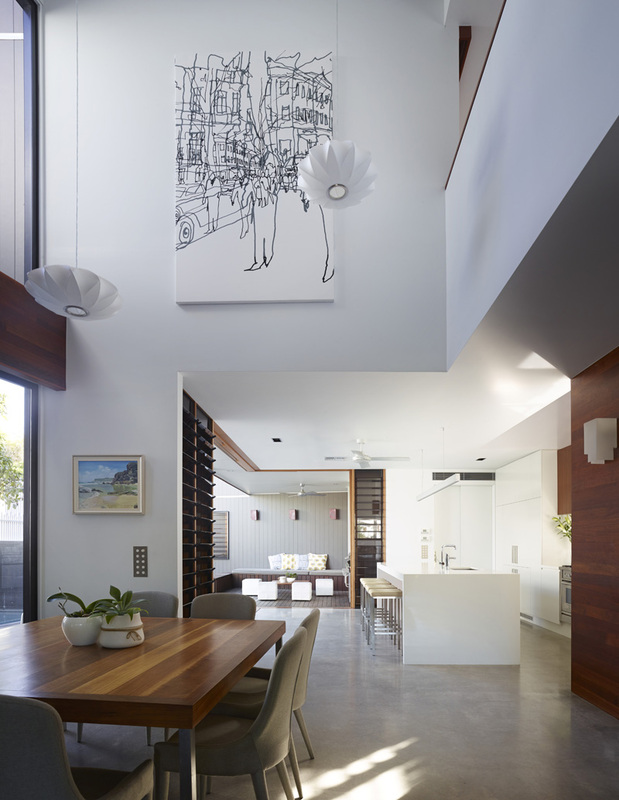 A beautiful black and white painting is installed on the wall just above the dining area. Gray chairs looked nice with the wooden dining table. Plants on white ceramic vases are minimal yet pleasant pieces that are added to the area. Gray items look lovely with the white kitchen that can be seen as a backdrop from the dining space. Remember the wooden verticals you saw in the exterior? 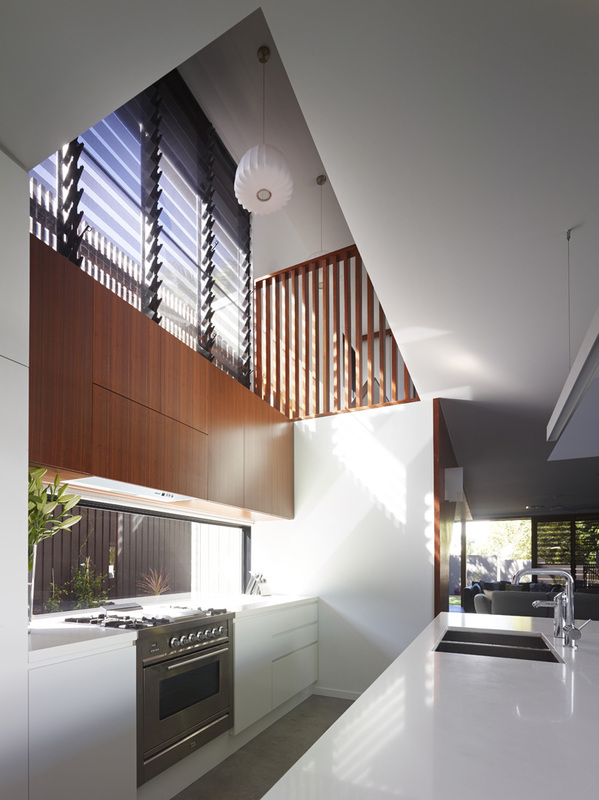 It could certainly filter the amount of light that goes inside the house just like what you can see in this modern kitchen. Modern appliances are used here with wood and white combinations for the cabinets. It would also be nice to work here while looking out the fixed window. Since this house is built by its owner, we are certain that it is done with all the considerations needed to be taken into and of course, it is durable and is a perfect fit for the family. 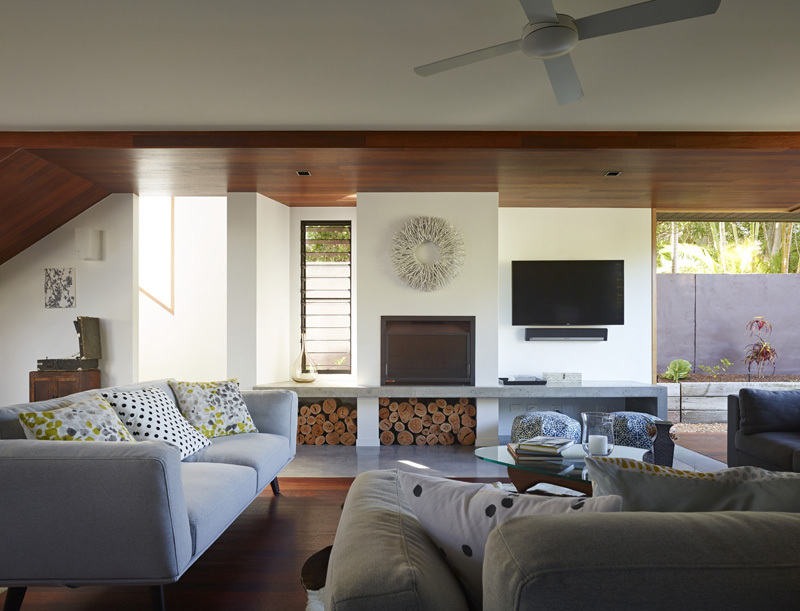 The design was done by Shaun Lockyer Architects who did an amazing job for the overall look of the home. 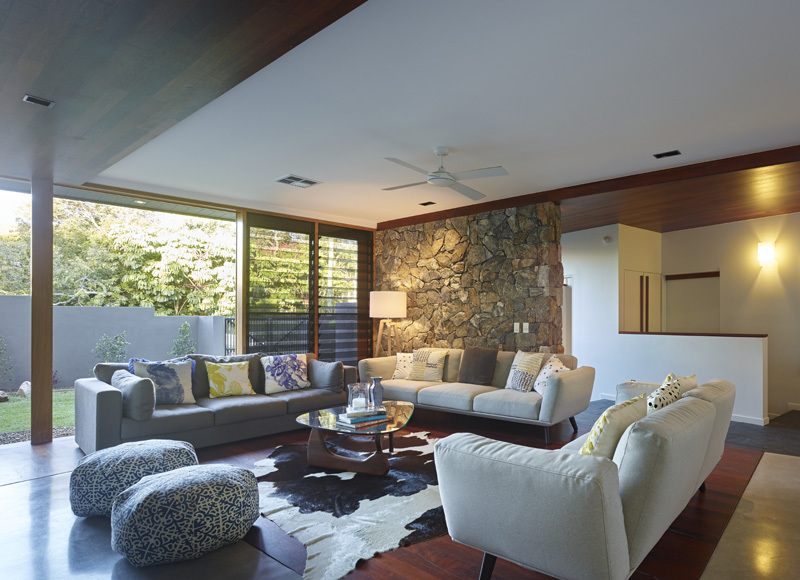 I like the combination of materials in this home as well as how the layout is done. How about you, can you tell me what you like about this house?